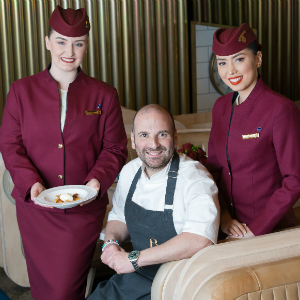 DOHA, Qatar, 2018-Aug-31 — /Travel PR News/ — Qatar Airways is delighted to announce its expanded collaboration with renowned Australian chef and restauranteur, George Calombaris, who will create a new edition of Greek-inspired in-flight dining options for the airline, starting 1 September 2018. The new menus will be available to First and Business Class passengers travelling from Qatar Airways’ four gateways in Australia (Adelaide, Melbourne, Perth, Sydney) to Doha, Qatar. Qatar Airways is also working with Chef Calombaris to feature his signature touch in the Economy Class menu, due to debut in the first quarter of 2019. This entry was posted in Airlines, Flights, Food & Drinks, Travel, Travel Services, Travelers and tagged australia, dining, George Calombaris, Greek_inspired, in_flight, Mr. Akbar Al Baker, passengers, Qatar Airways. Bookmark the permalink.